When I was a little kid some times I would be lucky to get to go to the arcade with my two older brothers. Naturally, we would try to play multi-player games so that we could all play together. 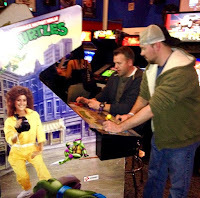 Other than X-Men no other arcade game close to Konami's TEENAGE MUTANT NINJA TURTLES. We played this all the time! I have tons of great memories from this game. So much so that when my oldest brother visited last year we made the trip up to YESTERCADES and played this one more time. For many years now people have hoped that NECA would get another crack at the TMNT line. Back in 2008 they made the wildly popular Mirage versions of the Teenage Mutant Ninja Turtles. They made a full color version as well as a black and white version. NECA also had other figures completed to go with them that never made it to production. Ever since then people have been waiting for NECA to be able to do something with the line again...especially since Playmates current lackluster products cater to only young children. At one of our last visits with Randy we got a sneak peak at these radical Turtles. Just like everyone else we were pretty hyped about it. Let's take a look at how both the TMNT and FOOT four packs turned out. 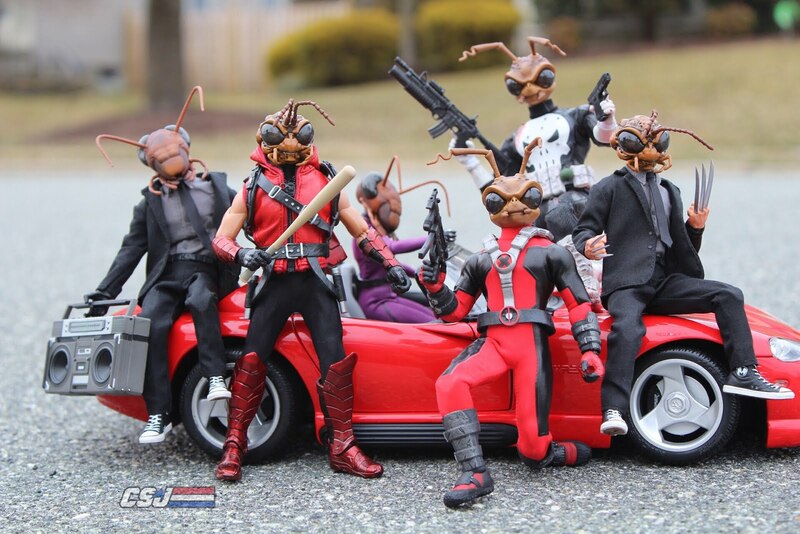 As usual, it's not enough for NECA to put out amazing action figures. They always put in the extra effort to make sure the packaging is just as cool. These sets come in a flapped window box. The cover of the box looks like the cabinet art from the original arcade game. The back of the box shows the Turtles as they appear on the character select screen in the game. Once you open the box you will see the Turtles lined up at the top. The bottom flap mimics the joystick layout from the arcade game along with the original TMNT logo. The only difference between the TMNT set and the FOOT set is that the baddies version says FOOT on the left hand side and has the pixelated Foot Clan symbol on the right. Leonardo: two katanas, two closed fist hands, two pointing finger hands, and his belt can hold his weapons in the rear. Michelangelo: two nunchucks, two closed fist hands, two thumbs up hands, and an extra (very awesome) spinning nunchuck effect that can plug into the place of the chain. Donatello: bo staff which snaps apart in middle for easier posing/displaying, two closed fist hands, two open hands, and his weapon can also be held in the rear of his belt. Raphael: two sais, two closed fist hands, two gripping hands which allows Raph to hold his weapons between his fingers in his signature pose, and a box of pizza. White Foot Soldier, Purple Foot Soldier, Orange Foot Solder: two open hands, two closed hands. Weapons are not as recognizably character specific as the Turtles or Shredder. Their weapons include a throwing star, a sword, a stick of dynamite, a rifle (which looks a lot like the Brain-Drain Gun that came with the original Playmates Krang), a giant hammer, and a naginata. As a die hard TMNT fan these were a "must have" for me. They are super bright and fun which just takes me right back to my childhood. I love these figures, and there isn't much of anything I can think of that NECA could have done to improve them further. I loved my Playmates figures as a kid, but these figures are the Teenage Mutant Ninja Turtles figures that I have always wanted. They are fantastic from head to toe...the paint, the sculpts, the accessories, and the packaging. To say that I am ecstatic that NECA is able to work on this line again is a huge understatement. I am extremely grateful that I was able to have a chance to get these. These figures are nearly flawless. The only negative I can even think of is that the Turtles are a little top heavy due to the shells which can make it difficult for them to hold certain action poses. Luckily, that's nothing that a NECA Dynamic Action Figure Stand shouldn't be able to fix. Lastly, if you're a young one and have never played the Konami TMNT arcade game then go find an arcade immediately and play it. You're appreciation for how awesome these figures will only go up even more!